This is an updated Working Draft of the Web Services Policy 1.5 - Primer specification. This Working Draft was produced by the members of the Web Services Policy Working Group, which is part of the W3C Web Services Activity. The Working Group expects to advance this Working Draft to Working Group Note. There are no open issues against this document, see Bugzilla. A list of changes in this version of the document and a diff-marked version against the previous version of this document are available. Major editorial changes in this version of the document encompass updates of various references. 3. Advanced Concepts: Policy Expression this is the advanced section that provides more in-depth materials for policy implementers and assertion authors. It explains the basics of normalizing policy expressions, merging policies, determining the compatibility (intersection) of policies, the policy data model, the policy expression and the extensibility points built into the Web Services Policy language. 4. Versioning Policy Language provides examples and best practices on versioning of the policy language itself, mostly intended for policy implementers. The Web Services Policy 1.5 - Guidelines for Policy Assertion Authors specification provides guidelines for designing policy assertions and enumerates the minimum requirements for describing policy assertions in specifications. Let us look at a fictitious scenario used in this document to illustrate the features of the policy language. A Web service developer is building a client application that retrieves real time stock quote information from Company-X, Ltd. Company-X supplies real time data using Web services. The developer has Company-X’s advertised WSDL description of these Web services. Company-X requires the use of addressing headers for messaging. Just the WSDL description is not sufficient for the developer to enable the interaction between her client and these Web services. WSDL constructs do not indicate requirements such as the use of addressing. Providers have the option to convey requirements, such as the use of addressing, through word-of-mouth and documentation – as they always have. To interact successfully with this service, the developer may have to read any related documentation, call someone at Company-X to understand the service metadata, or look at sample SOAP messages and infer such requirements or behaviors. Web Services Policy is a machine-readable language for representing these Web service capabilities and requirements as policies. Policy makes it possible for providers to represent such capabilities and requirements in a machine-readable form. For example, Company-X may augment the service WSDL description with a policy that requires the use of addressing. The client application developer can use a policy-aware client that understands this policy and engages addressing automatically. How does Company-X use policy to represent the use of addressing? The example below illustrates a policy expression that requires the use of addressing. The policy expression in the above example consists of a Policy main element and a child element wsam:Addressing. Child elements of the Policy element are policy assertions. Company-X attaches the above policy expression to a WSDL binding description. The wsam:Addressing element is a policy assertion. (The prefix wsam is used here to denote the Web Services Addressing – Metadata XML Namespace.) This assertion identifies the use of Web Services Addressing information headers. A policy-aware client can recognize this policy assertion, engage addressing automatically, and use headers such as wsa:To and wsa:Action in SOAP Envelopes. In addition to requiring the use of addressing, Company-X requires the use of transport-level security for protecting messages. Similar to the use of addressing, Company-X indicates the use of transport-level security using a policy expression. The example below illustrates a policy expression that requires the use of addressing and transport-level security for securing messages. The client application developer can use a policy-aware client that recognizes this policy expression and engages both addressing and transport-level security automatically. Thus far, we explored how Company-X uses policy expressions and assertions for representing behaviors that must be engaged for a Web service interaction. What is a policy assertion? What role does it play? In brief, a policy assertion is a piece of service metadata, and it identifies a domain (such as messaging, security, reliability and transaction) specific behavior that is a requirement. Company-X uses a policy assertion to convey a condition under which they offer a Web service. A policy-aware client can recognize policy assertions and engage these behaviors automatically. Providers, like Company-X, have the option to combine behaviors for an interaction from domains such as messaging, security, reliability and transactions. 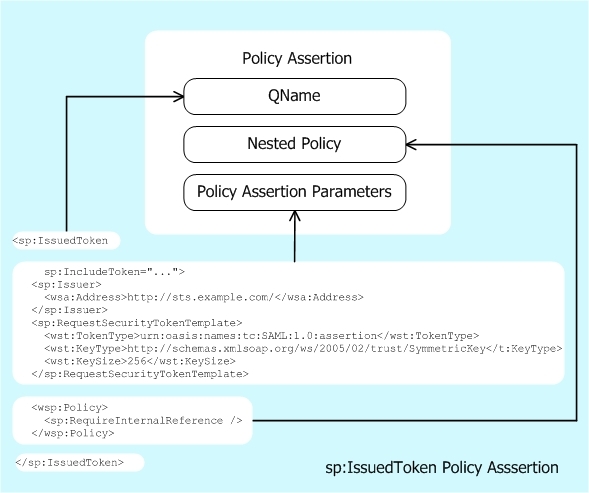 Using policy assertions, providers can represent these behaviors in a machine-readable form. Web service developers can use policy-aware clients that recognize these assertions and engage these behaviors automatically. In addition to requiring the use of addressing, Company-X allows either the use of transport- or message-level security for protecting messages. Web Services Policy language can indicate this choice of behaviors in a machine-readable form. To indicate the use of message-level security for protecting messages, Company-X uses the sp:AsymmetricBinding policy assertion (see the example below). To allow the use of either transport- or message-level security, Company-X uses the ExactlyOne policy operator. Policy assertions combined using the ExactlyOne operator requires exactly one of the behaviors represented by the assertions. The policy expression in the example below requires the use of either transport- or message-level security for protecting messages. Company-X requires the use of addressing and requires the use of either transport- or message-level security for protecting messages. They represent this combination using the All and ExactlyOne operators. Policy operators can be mixed to represent different combinations of behaviors (capabilities and requirements). The policy expression in the example below requires the use of addressing and one of transport- or message-level security for protecting messages. Using this policy expression, Company-X gives the choice of mechanisms for protecting messages to clients (or requesters). Through a customer survey program, Company-X learns that a significant number of their customers prefer to use the Optimized MIME Serialization (as defined in the MTOM specification) for sending and receiving messages. Company-X adds optional support for the Optimized MIME Serialization and expresses this optional behavior in a machine-readable form. To indicate the use of optimization using the Optimized MIME Serialization, Company-X uses the mtom:OptimizedMimeSerialization policy assertion (see the example below). The mtom:OptimizedMimeSerialization element is a policy assertion. (The prefix mtom is used here to denote the Optimized MIME Serialization Policy namespace.) This assertion identifies the use of MIME Multipart/Related serialization as required for request and response messages. Policy-aware clients can recognize this policy assertion and engage Optimized MIME Serialization for messages. The semantics of this assertion are reflected in messages: they use an optimized wire format (MIME Multipart/Related serialization). Like Company-X’s optional support for Optimized MIME Serialization, there are behaviors that may be engaged (in contrast to must be engaged) for a Web service interaction. A service provider will not fault if these behaviors are not engaged. Policy assertions can be marked optional to represent behaviors that may be engaged for an interaction. A policy assertion is marked as optional using the wsp:Optional attribute. Optional assertions represent the capabilities of the service provider as opposed to the requirements of the service provider. In the example below, the Optimized MIME Serialization policy assertion is marked optional. This policy expression allows the use of optimization and requires the use of addressing and one of transport- or message-level security. If a client sends an optimized (MTOM) message, this will be indicated by characteristics associated by using such an optimized message, including a wire format that is a Multipart/Related message and a content-type header of "application/xop+xml" for the outer package. In this case, the response message will also be optimized, also having a Multipart/Related message and content-type header of "application/xop+xml". 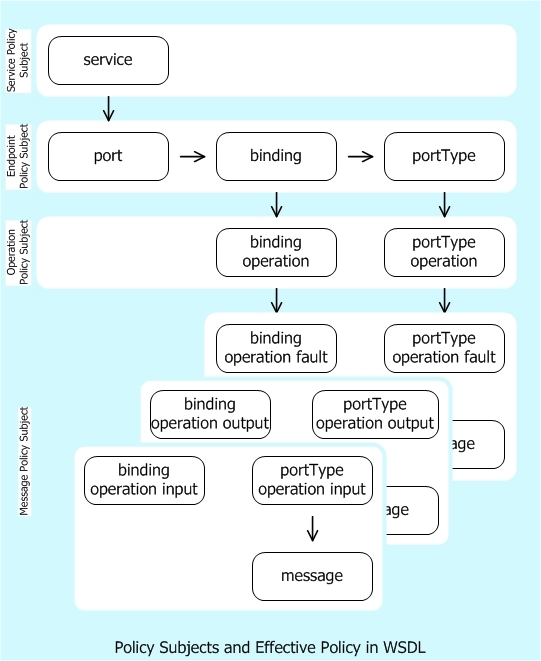 Note that when optimized messages are used, the Multipart/Related message can have a single part containing the primary SOAP envelope. Company-X is able to meet their customer needs by adding optional support for the Optimized MIME Serialization. Optional support is outlined in section 3.4 Web Services Policy 1.5 - Framework and detailed in section 4.5.2, Web Services Policy 1.5 - Guidelines for Policy Assertion Authors, specifically for Optimized MIME Serialization. An optional policy assertion represents a behavior that may be engaged. When a policy assertion is absent from a policy vocabulary (See section 3.2, Web Services Policy 1.5 - Framework), a policy-aware client should not conclude anything (other than ‘no claims’) about the absence of that policy assertion. See section 2.11 Attaching Policy Expressions to WSDL on the absence of policy expressions. Suppose Company-X decides that it will log SOAP messages sent and received in an exchange. This behavior has no direct impact on the messages sent on the wire, and does not affect interoperability. Some parties might have a concern about such logging and might decide not to interact with Company-X knowing that such logging is performed. To address this concern, Company-X includes a Logging assertion in its policy to enable such parties to be aware of logging. By marking the Logging assertion with the wsp:Ignorable attribute with a value of "true" Company-X indicates that a requester may choose to either ignore such assertions or to consider them as part of policy intersection. An assertion that may be ignored for policy intersection is called an ignorable assertion. The wsp:Ignorable attribute allows providers to clearly indicate which policy assertions indicate behaviors that don’t manifest on the wire and may not be of concern to a requester when determining policy compatibility. Using the wsp:Optional attribute would be incorrect in this scenario, since it would indicate that the behavior would not occur if the alternative without the assertion were selected. The attribute wsp:Ignorable is of type xs:boolean. Omitting this attribute is semantically equivalent to including it with a value of "false". The use of the wsp:Ignorable attribute has no impact on normalization. Assertions marked with the wsp:Ignorable attribute remain marked with the wsp:Ignorable attribute after normalization. Please note that the impact of the ignorable attribute is at the discretion of policy consumers through selection of "lax" or "strict" mode (See 3.4.1 Strict and Lax Policy Intersection). Therefore ignorable assertions may have an effect on determining compatibility of provider and consumer policies. As described in the sections above and in Section 3.4.1 Strict and Lax Policy Intersection, the WS-Policy 1.5 specification defines two attributes that can be used to mark an assertion: wsp:Optional and wsp:Ignorable. The WS-Policy Framework allows a policy assertion to be marked with both "optional" and "Ignorable" attributes simultaneously. The presence of "@wsp:optional=true" on an assertion is a syntactic compact form for two alternatives in normal form, one with the assertion and the other without the assertion. Hence syntactically marking an assertion "A" with both the @wsp:Optional and @wsp:Ignorable with the value of "true" for both, is equivalent to two alternatives; one where the assertion A exists with @wsp:Ignorable=true and the second where the assertion A does not exist. In the previous sections, we considered two security policy assertions. In this section, let us look at one of the security policy assertions in a little more detail. As you would expect, securing messages is a complex usage scenario. Company-X uses the sp:TransportBinding policy assertion to indicate the use of transport-level security for protecting messages. Just indicating the use of transport-level security for protecting messages is not sufficient. To successfully interact with Company-X’s Web services, the developer must also know what transport token to use, what particular secure transport to use, what specific algorithm suite to use for performing cryptographic operations, etc. The sp:TransportBinding policy assertion can represent these dependent behaviors. In this section, let us look at how to capture these dependent behaviors in a machine-readable form. A policy assertion – like the sp:TransportBinding - identifies a visible domain specific behavior that is a requirement. Given an assertion, there may be other dependent behaviors that need to be enumerated for a Web Service interaction. In the case of the sp:TransportBinding policy assertion, Company-X needs to identify the use of a transport token, a secure transport, an algorithm suite for performing cryptographic operations, etc. A nested policy expression can be used to enumerate such dependent behaviors. Setting aside the details of using transport-level security, Web service developers can use a policy-aware client that recognizes this policy assertion and engages transport-level security and its dependent behaviors automatically. That is, the complexity of security usage is absorbed by a policy-aware client and hidden from these Web service developers. In another example, WS-Security Policy defines a sp:HttpToken assertion to contain three possible nested elements, sp:HttpBasicAuthentication, sp:HttpDigestAuthentication and sp:RequireClientCertificate. When the HttpToken is used with an empty nested policy in a policy expression by a provider, it will indicate that none of the dependent behaviors namely authentication or client certificate is required. A non-anonymous client who requires authentication or client certificate will not be able to use this provider solely on the basis of policy intersection algorithm alone. Company-X has numerous Web service offerings that provide different kinds of real-time quotes and book information on securities such as GetRealQuote, GetRealQuotes and GetExtendedRealQuote. To accommodate the diversity of Company-X’s customers, Company-X supports multiple WSDL bindings for these Web services. Company-X provides consistent ways to interact with their services and wants to represent these capabilities and requirements consistently across all of their offerings without duplicating policy expressions multiple times. How? It is simple - a policy expression can be named and referenced for re-use. Section 2.2 Simple Message, showed how a policy expression can be attached directly to a binding inline. A single policy expression may be used in several parts of a WSDL document. In this case it is desirable to use references to the policy expression rather than to directly inline the policy expression. A policy expression may be identified by an IRI and referenced for re-use as a standalone policy or within another policy expression. There are three mechanisms to identify a policy expression: the wsu:Id xml:id and Name attributes. A PolicyReference element can be used to reference a policy expression identified using either of these mechanisms. In addition to the Example 2-12, Company-X could have used either the xml:id or wsu:Id. An example of the use of xml:id similar to that of wsu:Id is shown in Example 2-13. Conditions and constraints on the use of the |xml:id| attribute in conjunction with Canonical XML 1.0 are specified in Appendix C of XML ID and are further detailed in C14N 1.0 Note . Significant care is suggested in the use of xml:id. For referencing a policy expression within the same XML document, Company-X uses the wsu:Id attribute for identifying a policy expression and an IRI to this ID value for referencing this policy expression using a PolicyReference element. The Name attribute is an alternate mechanism to identify a policy expression. The value of the Name attribute is an absolute IRI and is independent of the location of the XML document where the identified policy expression resides in. As such, referencing a policy expression using the Name attribute relies on additional out of band information. In the example below, the Name attribute identifies the policy expression. The IRI of this policy expression is http://x.example.com/policy/common. As policy expressions are composed from other policy expressions and assertions from different domains are used in a policy expression, complex expressions will emerge. Naming parts of complex expressions for reuse and building more complex policies through referencing enables building more complicated policy scenerios easily. This approach enables the association of additional policy subjects to identified policy expressions. It also promotes manageability of the expressions as they are uniquely identified and allows profiles for common scenerios to be developed. Note that when a named expression has assertions that contains parametrized expressions, care must be given to ensure that the parameterized content is statically available to enable reuse. A majority of Company-X’s customers use WSDL for building their client applications. Company-X leverages this usage by attaching policy expressions to the WSDL binding descriptions. In the example below, the SecureBinding WSDL binding description defines a binding for an interface that provides real-time quotes and book information on securities. (The prefixes wsdl and tns are used here to denote the Web Services Description language XML namespace and target namespace of this WSDL document.) To require the use of security for these offerings, Company-X attaches the secure policy expression in the previous section to this binding description. The WSDL binding element is a common policy attachment point. The secure policy expression attached to the SecureBinding WSDL binding description applies to any message exchange associated with any port that supports this binding description. This includes all the message exchanges described by operations in the RealTimeDataInterface. In addition to providing real-time quotes and book information on securities, Company-X provides other kinds of data through Web services such as quotes delayed by 20 minutes and security symbols through Web services (for example GetDelayedQuote, GetDelayedQuotes, GetSymbol and GetSymbols). Company-X does not require the use of security for these services, but requires the use of addressing and allows the use of optimization. In the example above, the OpenBinding WSDL binding description defines a binding for an interface that provides other kinds of data such as quotes delayed by 20 minutes and security symbols. To require the use of addressing and allow the use of optimization, Company-X attaches the common policy expression in the previous section to this binding description. As we have seen in the SecureBinding case, the common policy expression attached to the OpenBinding WSDL binding description applies to any message exchange associated with any port that supports this binding description. This includes all the message exchanges described by operations in the DelayedDataInterface. As mentioned earlier, providers have the option to convey requirements, such as the use of addressing or security, through word-of-mouth and documentation – as they always have. The absence of policy expressions, for example, in a WSDL document does not indicate anything about the capabilities and requirements of a service. The service may have capabilities and requirements that can be expressed as policy expressions, such as the use of addressing, security and optimization. Or, the service may not have such capabilities and requirements. A policy aware client should not conclude anything about the absence of policy expressions. Service providers, like Company-X, can preserve and leverage their investments in WSDL and represent the capabilities and requirements of a Web service as policies. A WSDL document may specify varying behaviors across Web service endpoints. Web service developers can use a policy-aware client that recognizes these policy expressions in WSDL documents and engages behaviors automatically for each of these endpoints. Any complexity of varying behaviors across Web service endpoints is absorbed by a policy-aware client or tool and hidden from these Web service developers. As you have seen, Web Services Policy is a simple language that has four elements - Policy, All, ExactlyOne and PolicyReference - and one attribute - wsp:Optional. In practice, service providers, like Company-X, use policy expressions to represent combinations of capabilities and requirements. Web service developers use policy-aware clients that understand policy expressions and engage the behaviors represented by providers automatically. A sizable amount of complexity is absorbed by policy-aware clients (or tools) and is invisible to these Web service developers. A policy expression is the XML representation and interoperable form of a Web Services Policy. A policy expression consists of a Policy wrapper element and a variety of child and descendant elements. Child and descendent elements from the policy language are Policy, All, ExactlyOne and PolicyReference. Other child elements of Policy, All and ExactlyOne are policy assertions. (The Policy element plays two roles: wrapper element and operator.) Policy assertions can contain a nested policy expression. Policy assertions can also be marked optional to represent behaviors that may be engaged (capabilities) for an interaction. The optional marker is the wsp:Optional attribute which is placed on a policy assertion element. Let us take a closer look at Company-X’s policy expression (see below) from the previous section. Let us look at the normal form for this policy expression. The example below is Company-X’s policy expression in the normal form. As you can see, the compact form is less verbose than the normal form. The normal form represents a policy as a collection of policy alternatives. Each of the All operators is a policy alternative. There are four policy alternatives in the normal form. These alternatives map to bullets (a) through (d) above. The PolicyReference element is replaced with its referenced policy expression. See section 3.6 Policy Retrieval for more details on how to retrieve referenced policy expressions. Company-X uses a policy to convey the conditions for an interaction. Policy-aware clients, like the one used by the developer in our example (as explained earlier in 2. Basic Concepts: Policy Expression), view policy as an unordered collection of zero or more policy alternatives. A policy alternative is an unordered collection of zero or more policy assertions. A policy alternative represents a collection of behaviors or requirements or conditions for an interaction. In simple words, each policy alternative represents a set of conditions for an interaction. The diagram below describes the policy data model. A policy-aware client uses a policy to determine whether one of these policy alternatives (i.e. the conditions for an interaction) can be met in order to interact with the associated Web Service. Such clients may choose any of these policy alternatives and must choose exactly one of them for a successful Web service interaction. Clients may choose a different policy alternative for a subsequent interaction. It is important to understand that a policy is a useful piece of metadata in machine-readable form that enables tooling, yet is not required for a successful Web service interaction. Why? Web service developers could use the documentation, talk to the service providers, or look at message traces to infer these conditions for an interaction. Developers continue to have these options, as they always had. The assertion parameters are the opaque payload of an assertion. Parameters carry additional useful pieces of information necessary for engaging the behavior described by an assertion. In the XML representation, the child elements and attributes of an assertion excluding the child elements and attributes from the WS-Policy language XML namespace name, are the assertion parameters. For example @wsp:Optional and @wsp:Ignorable are not assertion parameters. We considered nested policy expressions in the context of a security usage scenario. Let us look at its shape in the policy data model. A nested policy expression is a policy expression that is a child element of an assertion. In the normal form, a nested policy expression has at most one policy alternative. The policy alternative in a nested policy expression represents a collection of associated or dependent behaviors, requirements or conditions that qualify its parent policy assertion. A provider, like Company-X, and a requester, like the policy-aware client used in our example, may represent their capabilities and requirements for an interaction as policies and want to limit their message exchanges to mutually compatible policies. Web Services Policy defines an intersection mechanism for selecting compatible policy alternatives when there are two or more policies. The example below is a copy of Company-X’s policy expression (from 3.2 Normal Form for Policy Expressions). As we saw before, Company-X offers four policy alternatives. Of them, one of the policy alternatives requires the use of addressing and transport-level security. The client application developer's organization requires the use of addressing and transport-level security for any interaction with Company-X’s Web services. The developer represents these behaviors using a policy expression illustrated in the example below in normal form. This policy expression contains one policy alternative that requires the use of addressing and transport-level security. The developer lets her policy-aware client select a compatible policy alternative in Company-X’s policy. How does this client select a compatible policy alternative? It is simple – it uses the policy intersection. 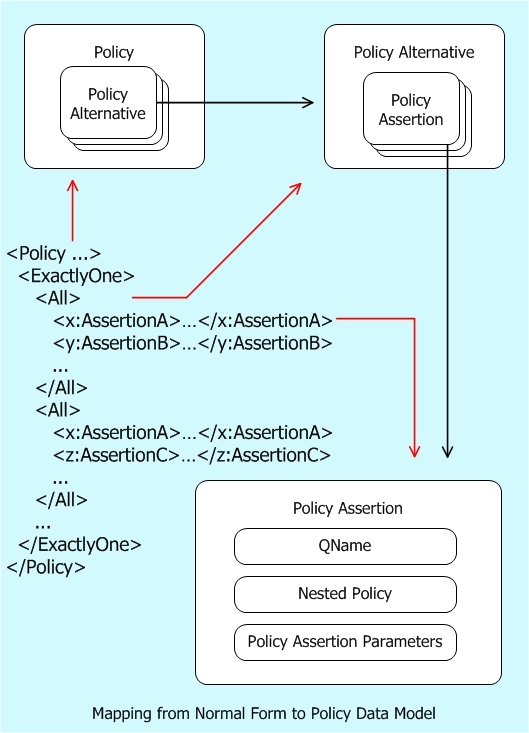 That is, the policy-aware client uses these two policy expressions (the client’s and Company-X’s) and the policy intersection to select a compatible policy alternative for this interaction. Let us look at the details of policy intersection. Two policy alternatives are compatible if each policy assertion in one alternative is compatible with a policy assertion in the other and vice-versa. For example, policy assertions (c1) and (c2) in Company-X’s policy alternative are compatible with policy assertions (t2) and (t1) in the client’s policy alternative. Company-X’s policy alternative (a) and the client’s policy alternative are compatible because assertions in these two alternatives are compatible. Two policies are compatible if a policy alternative in one is compatible with a policy alternative in the other. For example, Company-X’s policy alternative (a) is compatible with the client’s policy alternative. Company-X’s policy and the client’s policy are compatible because one of Company-X’s policy alternative is compatible with the client’s policy alternative. 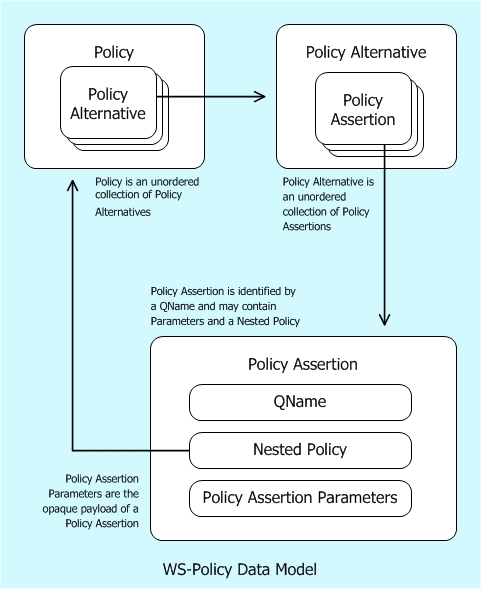 For this interaction, the developer’s policy-aware client can use policy alternative (a) to satisfy Company-X’s conditions or requirements. The previous sections outlined how the normal-form of a policy expression relate to the policy data model and how the compatibility of requester and provider policies may be determined. This section outlines how ignorable assertions may impact the process of determining compatibility. In order to determine compatibility of its policy expression with a provider policy expression, a requester may use either a "lax" or "strict" mode of the intersection algorithm. In the strict intersection mode two policy alternatives are compatible when each assertion in one is compatible with an assertion in the other, and vice versa. For this to be possible they must share the same policy alternative vocabulary. The strict intersection mode is the mode of intersection discussed in the previous sections of this document. When using the strict intersection mode all assertions are part of the policy alternative vocabulary, including those marked with wsp:Ignorable. Thus the wsp:Ignorable attribute does not impact the intersection result even when its attribute value is “true”. If a requester wishes to ignore ignorable assertions in a provider's policy, then the requester should use the lax intersection mode. In the lax intersection mode all ignorable assertions (i.e. with the value "true" for the wsp:Ignorable attribute) are to be ignored by the intersection algorithm. Thus in the lax intersection mode two policy alternatives are compatible when each non-ignorable assertion in one is compatible with an assertion in the other, and vice versa. For this to be possible the two policy alternatives must share a policy alternative vocabulary for all “non-ignorable” assertions. Regardless of the chosen intersection mode, ignorable assertions do not express any wire-level requirements on the behavior of consumers - in other words, a consumer could choose to ignore any such assertions that end up in the resulting policy after intersection, with no adverse effects on runtime interactions. Domain-specific processing could take advantage of any information from the policy data model, such as the ignorable property of a policy assertion. A requester can decide how to process a provider's policy to determine if and how the requester will interact with the provider. The requester can have its own policy that expresses its own capabilities and requirements, and can make one or more attempts at policy intersection in order to determine a compatible alternative and/or isolate the cause of an empty intersection result. The requester can use and analyze the result(s) of policy intersection to select a compatible alternative or trigger other domain-specific processing options. For example, a requester can at first attempt strict mode intersection, and then lax mode as another choice, if the previous attempt returns an empty intersection result. In 2. Basic Concepts: Policy Expression, we looked into how Company-X attached their policy expressions to the WSDL binding element. In addition to the WSDL binding element, a policy expression can be attached to other WSDL elements such as service, port, operation and message. These elements are the WSDL policy attachment points in a WSDL document. If the referenced policy expression is in the same XML document as the reference, then the policy expression should be identified using the wsu:Id|xml:id (XML ID) attribute and referenced using an IRI reference to this XML ID value. WSDL 1.1 [ WSDL 1.1 ] section 2.1 and WSDL 2.0 [ WSDL 2.0 Core Language ] chapter 4 allow to import or include WSDL documents into another WSDL document with the wsdl11:import, wsdl20:import, and wsdl20:include statements. The importing and imported WSDL documents constitute separate XML documents each. If e.g. the importing WSDL document references a policy in the imported WSDL document, the rules for policy references between separate XML documents apply as described in 2.10 Referencing Policy Expressions. Multiple policy expressions may be attached to WSDL constructs. Let us consider how Company-X could have used multiple policy expressions in a WSDL document. In the example below, there are two policy expressions #common2 and #secure2 attached to the SecureBinding WSDL binding and RealTimeDataPort WSDL port descriptions. The policy expression below is the combination of the two policy expressions attached to the SecureBinding WSDL binding and RealTimeDataPort WSDL port descriptions. The #common2 policy expression has two policy alternatives. The #secure2 policy expression has two policy alternatives. The combination of these two policies is equivalent to Company-X’s secure policy in 2. Basic Concepts: Policy Expression and has four policy alternatives. In other words, the combination of two policies is the cross product of alternatives in these two policies. Web Services Policy language is an extensible language by design. The Policy, ExactlyOne, All and wsp:PolicyReference elements are extensible. The Policy element allows child element and attribute extensibility, while the ExactlyOne and All elements allow child element extensibility. The PolicyReference child element allows element and attribute extensibility. Extensions must not use the policy language XML namespace name. A consuming processor processes known attributes and elements, ignores unknown attributes and treats unknown children of the Policy, ExactlyOne, All elements as policy assertions. The child elements of wsp:PolicyReference are ignored. The PolicyReference element allows element and attribute extensibility. Services that use the Web Services Policy language for policy expression enable simple versioning practices that allow requesters to continue the use of older policy alternatives in a backward compatible manner. This versioning practice allows service providers, like Company-X, to deploy new behaviors using additional (or new) policy assertions without breaking compatibility with clients that rely on any older policy alternatives. We use examples below to illustrate how versioning might be done. The example below represents a Company-X version 1 policy expression. This expression requires the use of addressing and transport-level security for protecting messages. Over time, Company-X adds support for advanced behaviors: requiring the use of addressing and message-level security for protecting messages. They would like to add this advanced support without breaking compatibility with requesters that rely on addressing and transport-level security. The example below is Company-X’s version 2 policy expression. In this version, Company-X adds a new policy alternative that requires the use of addressing and message-level security. The clients that rely on addressing and transport-level security may continue to interact with Company-X’s using the old policy alternative. Of course, these clients have the option to migrate from using old policy alternatives to new policy alternatives. When Company-X added support for advanced behaviors, they spent time to plan for the continued support for existing clients, the smooth migration from using current to advanced behaviors, and the switch to use only the advanced behaviors in the near future (i.e. sun-setting current behaviors). In this versioning scenario, a policy expression with multiple alternatives was used to represent current and advanced behaviors in a non-disruptive manner: no immediate changes to existing clients are required and these clients can smoothly migrate to new functionality when they choose to. This level of versioning support in a policy expression enables the same class of versioning best practices built into WSDL constructs such as service, port and binding. Let us look at tooling for unknown policy assertions. As service providers, like Company-X, incrementally deploy advanced behaviors, some requesters may not recognize these new policy assertions. As discussed before, these requesters may continue to interact using old policy alternatives. New policy assertions will emerge to represent new behaviors and slowly become part of everyday interoperable interaction between requesters and providers. For example, most tools use a practical tolerant strategy to process new or unrecognized policy assertions. These tools consume such unrecognized assertions and designate these for user intervention. As you would recognize, there is nothing new in this practice. This is similar to how a proxy generator that generates code from WSDL creates code for all the known WSDL constructs and allows Web service developers to fill in code for custom or unknown constructs in the WSDL. One potential use of the wsp:Ignorable attribute is to mark versioning related information by creating a new policy assertion within a policy expression. The new assertion is added to the original policy expression and then the service can update the assertion parameter values when the service expires. One scenario that illustrates this is a service which will support a particular version of a service until a certain point in time. After that time, the service will not be supported. In this scenario, the expiry date and time of the service would be a new policy assertion [see Guidelines section 4] that the service provider defines . This hypothetical EndOfLife policy assertion is then included in the original policy expression, but it could be marked as ignorable. The service, in this case, wants to inform the consumers it does have an expiry time, and so it is useful to convey this information from the beginning to help smooth the versioning process. Company-X could specify that one policy alternative will expire at a certain point in time using the hypothetical ignorable Company-X expiry assertion. The example below shows how Company-X can create a new version 2 policy expression with a second hypothetical ignorable EndOfLife Assertion with a different date and time. In this variant of the versioning scenario, the use of ignorable allows versioning related information to be conveyed and used where understood. In a scenario such as this, CompanyX is acting as both a policy assertion author and a policy expression author. As a policy expression author, when an assertion type is tagged as ignorable information, the use of strict or lax mode and presence or absence of the assertion type in the first version are important decisions. does not know about the assertion and using lax intersection will produce an intersection. does not know about the assertion and using strict intersection will not produce an intersection. does know about the assertion and using strict or lax intersection will produce an intersection. does or does not know about the assertion and using lax or strict intersection will produce an intersection. If Company-X adds the hypothetical EndOfLife policy assertion type to a subsequent Alternative and does not mark the assertion with wsp:Optional="true", then after the policy expression has been deployed/used the same algorithm holds true, notably that a client using strict mode that does not understand the assertion will not intersect with the alternative. If CompanyX adds the hypothetical EndOfLife policy assertion with an ignorable attribute and does mark the assertion with wsp:Optional="true", then clients using strict mode who do not understand the hypothetical EndOfLife assertion with the ignorable information will still be compatible with the alternative that does not contain the hypothetical EndOfLife policy assertion as per the intersection rules. When wsp:Ignorable="true" is used, clients that are unaware of the hypothetical EndOfLife assertion may make more requests for expired services. This could result in servers generating Faults if the request is received after the expiry date. . If Company-X knows about the hypothetical EndOfLife Policy assertion, it can guarantee that clients that know or don't know about the hypothetical EndOfLife Policy Assertion can intersect under any mode by marking the assertion with wsp:Optional="true". Clients that know about the hypothetical EndOfLife Policy assertion and performing strict intersection can guarantee interaction with services that know or don't know about the hypothetical EndOfLife Policy assertion by marking the assertion with wsp:Optional="true". Clients that know about the hypothetical EndOfLife Policy assertion and performing lax intersection can guarantee interaction with services that know or don't know about the hypothetical EndOfLife Policy assertion by marking the assertion with wsp:Optional="true" or marking it with wsp:Ignorable="true". Because the actual value of the date/time may not be known when the policy expression is first created, a value that is roughly infinitely in the future is used. A subsequent policy alternative could refine the value and domain specific processing of the assertion can differentiate the value. The advantage of adding the end of life information through a domain specific assertion is that some clients will have a machine processable way of knowing when the alternative will no longer be supported by evaluating the policy assertions in a policy expression. Without this information in a policy expression, the information must be conveyed in some other way or it will not be conveyed at all. This can usefully smooth the transition between versions of a service. The disadvantage of adding the end of life information through a domain specific assertion is that clients need to understand the semantics of the hypothetical EndOfLife assertion in order to know whether a particular alternative is still valid. For example, a client that doesn’t know what the parameter “Mar-31-2008” means, will not know that the service is no longer available on April 1, and may send messages to this service in April, and if the service enforces “end of life”, these messages may fail. The sp:IssuedToken security policy assertion identifies a visible domain specific behavior: the use of a security token – such as SAML token - issued by a third party for protecting messages. This behavior is relevant to a Web service interaction. For the sake of discussion, let us assume that Company-X requires the use of a SAML token issued by a third party. Service providers, like Company-X, must convey this usage and all the necessary information to obtain this security token for Web service developers. This is a key piece of metadata for a successful interaction with Company-X’s Web services. WS-Policy Framework 1.5 specifies that any child element that is not known inside a Policy, ExactlyOne or All will be treated as an assertion. The default value for wsp:Optional="false". After normalization, such an element will be inside an ExactlyOne/All operator. Example 4-1. Policy containing 1.5 and 1.6 Policies. Example 4-3. Policy containing explicit wsp:Optional="true"
Example 4-6. Policy containing 2.0 only Policies. Example 4-7. Policy containing 2.0 (incompatible with 1.5) Policies embedded in wsp 1.5 Policy. Example 4-9. WSDL containing 1.5 and 2.0 (compatible with 2.0) Policy References. Example 4-10. WSDL containing 1.5 and 2.0 (compatible with 2.0) Policy References. XML Security Specifications Maintenance Working Group , See http://www.w3.org/2007/xmlsec. Web Services Addressing 1.0 - Metadata , M. Gudgin, M. Hadley, T. Rogers and Ü. Yalçinalp, Editors. World Wide Web Consortium, 31 July 2007. This is a work in progress. This version of the Web Services Addressing 1.0 - Metadata is http://www.w3.org/TR/2007/PR-ws-addr-metadata-20070731/. The latest version of Web Services Addressing 1.0 - Metadata is available at http://www.w3.org/TR/ws-addr-metadata. Web Services Policy 1.5 - Framework , A. S. Vedamuthu, D. Orchard, F. Hirsch, M. Hondo, P. Yendluri, T. Boubez and Ü. Yalçinalp, Editors. World Wide Web Consortium, 6 July 2007. This version of the Web Services Policy 1.5 - Framework specification is at http://www.w3.org/TR/2007/PR-ws-policy-20070706/. The latest version of Web Services Policy 1.5 - Framework is available at http://www.w3.org/TR/ws-policy/. Web Services Policy 1.5 - Attachment , A. S. Vedamuthu, D. Orchard, F. Hirsch, M. Hondo, P. Yendluri, T. Boubez and Ü. Yalçinalp, Editors. World Wide Web Consortium, 6 July 2007. This version of the Web Services Policy 1.5 - Attachment specification is at http://www.w3.org/TR/2007/PR-ws-policy-attach-20070706/. The latest version of Web Services Policy 1.5 - Attachment is available at http://www.w3.org/TR/ws-policy-attach/. Web Services Reliable Messaging Policy Assertion (WS-RM Policy) Version 1.1 , D. David, A. Kamarkar, G. Pilz, and Ü. Yalçinalp, Editors. Organization for the Advancement of Structured Information Standards, OASIS Standard, 14 June 2007. This version available at http://docs.oasis-open.org/ws-rx/wsrmp/200702/wsrmp-1.1-spec-os-01.pdf. Web Services Description Language (WSDL) Version 2.0 Part 1: Core Language , R. Chinnici, J. J. Moreau, A. Ryman, S. Weerawarana, Editors. World Wide Web Consortium, 26 June 2007. This version of the WSDL 2.0 specification is http://www.w3.org/TR/2007/REC-wsdl20-20070626/. The latest version of WSDL 2.0 is available at http://www.w3.org/TR/wsdl20. xml:id Version 1.0 , J. Marsh, D. Veillard and N. Walsh, Editors. World Wide Web Consortium, 9 September 2005. This version of the xml:id Version 1.0 Recommendation is http://www.w3.org/TR/2005/REC-xml-id-20050909/. The latest version of xml:id Version 1.0 is available at http://www.w3.org/TR/xml-id/. Canonical XML 1.1 , J. Boyer and G. Marcy Authors. W3C Candidate Recommendation, 21 June 2007. This is a work in progress. This version is available at http://www.w3.org/TR/2007/CR-xml-c14n11-20070621. The latest version of Canonical XML 1.1 is available at http://www.w3.org/TR//xml-c14n11/. Members of the Working Group are (at the time of writing, and by alphabetical order): Dimitar Angelov (SAP AG), Abbie Barbir (Nortel Networks), Charlton Barreto (Adobe Systems Inc.), Sergey Beryozkin (IONA Technologies, Inc.), Vladislav Bezrukov (SAP AG), Toufic Boubez (Layer 7 Technologies), Symon Chang (BEA Systems, Inc.), Paul Cotton (Microsoft Corporation), Glen Daniels (Progress Software), Doug Davis (IBM Corporation), Jacques Durand (Fujitsu Limited), Ruchith Fernando (WSO2), Christopher Ferris (IBM Corporation), William Henry (IONA Technologies, Inc.), Frederick Hirsch (Nokia), Maryann Hondo (IBM Corporation), Ondrej Hrebicek (Microsoft Corporation), Steve Jones (Layer 7 Technologies), Tom Jordahl (Adobe Systems Inc.), Paul Knight (Nortel Networks), Philippe Le Hégaret (W3C/MIT), Mark Little (JBoss Inc.), Mohammad Makarechian (Microsoft Corporation), Ashok Malhotra (Oracle Corporation), Jonathan Marsh (WSO2), Monica Martin (Sun Microsystems, Inc.), Arnaud Meyniel (Axway Software), Jeff Mischkinsky (Oracle Corporation), Dale Moberg (Axway Software), Anthony Nadalin (IBM Corporation), David Orchard (BEA Systems, Inc.), Sanjay Patil (SAP AG), Manjula Peiris (WSO2), Fabian Ritzmann (Sun Microsystems, Inc.), Daniel Roth (Microsoft Corporation), Tom Rutt (Fujitsu Limited), Sanka Samaranayake (WSO2), Felix Sasaki (W3C/Keio), Yakov Sverdlov (CA), Asir Vedamuthu (Microsoft Corporation), Sanjiva Weerawarana (WSO2), Ümit Yalçinalp (SAP AG), Prasad Yendluri (webMethods, Inc.). Previous members of the Working Group were: Jeffrey Crump, Jong Lee, Bob Natale, Eugene Osovetsky, Bijan Parsia, Skip Snow, Seumas Soltysik, Mark Temple-Raston. Updated references - [ C14N11 ], [ Web Services Reliable Messaging Policy Assertion ] and [ WS-Addressing Metadata ]. 20061020 PY Implemented resolution for Issue 3827. Editors Action Item 56. 20061027 TIB Implemented resolution for Issue 3815. Editors Action Item 55. 20061101 TIB Implemented resolution for Issue 3815. Editors Action Item 68. 20061101 PY Implemented the resolution for Issue 3791. Editors Action Item 67. 20061121 ASV Implemented the resolution for issue 3809. Editors Action Item 79. 20061121 ASV Implemented the resolution for issue 3966. Editors Action Item 81. 20061125 ASV Reset Section E. Changes in this Version of the Document. 20061125 ASV Implemented the resolution for issue 3792. Editors Action Item 80: moved Sections 4.2 Parts of a Policy Assertion and 4.4.8 Versioning Policy Language into Section 3. Advanced Concepts: Policy Expression; moved Section 4 Advanced Concepts II: Policy Assertion Design into the Guidelines document. 20061127 ASV Added Frederick and Umit to the list of editors. Editors' action 86. 20061207 FJH Implemented the resolution for issue 3952 as outlined (with editorial correction replacing "for as" with "as"), Editors' action 92. 20061213 TIB Implemented the resolution for issue 3965 as outlined. Editors' action 94. 20070104 MH Implemented the resolution for issue 4069 as outlined. Editors' action 110. 20070118 FJH Implemented the resolution for issue 4041 resolution corresponding to Editors' action 143. 20070131 FJH Implemented resolution for issue 4270 as Resolved on 31 January 2007, closing editors action 151. 20070313 FJH Applied resolution to issue 4379 with minor editorial revision (editors action 181). Updated references order. 20070314 FJH Applied resolution to issue 4263 (editors action 195). 20070315 PY Applied the resolution to issue 4339 (editors action 194). 20070315 PY Applied the resolution to issue 4262 (editors action 201). 20070315 FJH Applied resolution to issue 4255 (editors action 192). 20070315 ASV Implemented the resolution for issue 4288. Editors' action 196. 20070315 FJH Applied resolution to issue 4253 (editors action 191). 20070319 MH Implemented the resolution for issue 4213 as outlined. Editors' action 189. 20070319 PY Implemented the resolution for issue 4103 as outlined. Editors' action 193. 20070320 ASV Implemented the resolution for issue 4300. Editors' action 190. 20070321 ASV Formatted the example in 3.8.3 Use of Ignorable attribute and an alternative Versioning Scenario. 20070322 ASV Deleted residual text in 4. Versioning Policy Language; s/The possible extensibility points with their current extensibility - including some outstanding issues related to extensibility - are:/The possible extensibility points are:/ ; s/PolicyReference: any attribute and a proposal to add any element/PolicyReference: any attribute and any element/. 20070426 PY Editorial changes to align with the OASIS WS-SecurityPolicy specification. For issue 4318. Editors' action 244. 20070430 TIB Editorial changes for issue 4393. Editors' action 239. 20070501 ASV Reset Section E. Changes in this Version of the Document. 20070502 TIB Further changes for issue 4393. Editors' action 239. 20070502 DBO Finished changes for issue 4414. Editors' action 239. 20070718 FJH Updated the C14N11 reference [ C14N11 ] for issue 4851. Editors' action 337. 20070718 FJH Updated Web Services Reliable Messaging Policy reference [ Web Services Reliable Messaging Policy Assertion ] and WS-Addressing Metadata reference [ WS-Addressing Metadata ]. Editors' action 331. 20070727 ASV Fixed a typo in Section 3.4 Compatible Policies. Editors' action 349. 20070727 ASV Implemented the resolution for issue 4857. Editors' action 350. 20070727 ASV Updated Section E. Changes in this Version of the Document. 20070806 FS Updated references for draft publication.